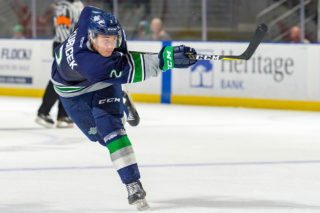 KELOWNA, February 23, 2018 — Kole Lind scored with 1:21 left in the game Friday night at Prospera Place to give his Kelowna Rockets a 5-4 win over the Seattle Thunderbirds. The T-Birds next game is Saturday at 6:05pm against the Everett Silvertips at accesso ShoWare Center. This game is the T-Birds annual Hockey Challenge to support Ronald McDonald House Charities of Western Washington & Alaska. Seattle (28-23-7-2) took a 1-0 lead at 7:26 of the first period. Dillon Hamaliuk worked the puck up the left boards to Turner Ottenbreit at the left point. Ottenbreit took a wrist shot that was going wide of the Kelowna net. Donovan Neuls had his back to Rockets’ goalie Brodan Salmond and reached out to his right and tipped Ottenbreit’s shot into the net. The goal was Neuls 20th of the season. The T-Birds took a 2-0 lead just over four minutes after their first goal. Nolan Volcan knocked down a Kelowna pass in the offensive zone. Matthew Wedman got to the loose puck in the left corner. Wedman skated behind the Kelowna net and attempted a wraparound at the right post. The puck came off Salmond right to Dillon Hamaliuk at the left post. Hamaliuk banged the puck into the net for his 14th goal of the season. The Rockets outshot the T-Birds 9-8 in the first period. Kelowna (37-18-4-2) cut the T-Birds lead to one goal 19 seconds into the second period on a goal from Cal Foote. 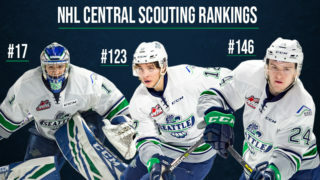 Dillon Dube and Conner Bruggen-Cate had the assists. The Rockets tied the game 2-2 when Dillon Dube scored at 2:13 of the second. Leif Mattson and Erik Gardiner were credited with the assists. Kelowna outshot Seattle 12-7in the second period and led 21-15 in shots after two periods. The Rockets scored two power-play goals in the first half of the third period to take a 4-2 lead. Leif Mattson scored at 2:46 and Jack Cowell scored at 7:13. The T-Birds came back and tied the game 4-4 with two goals in 29 seconds late in the third period. Matthew Wedman took a feed on the left wing from Nolan Volcan for a two-on-one break. Wedman skated into the left circle and beat Salmond over the glove with a wrist shot at 14:46. Jarret Tyszka had the second assist on Wedman’s 15th goal of the season. Off the ensuing faceoff the T-Birds got the puck deep in the Kelowna zone. Hamaliuk got the puck to Noah Philp at the left point. Philp took a shot that Zack Andrusiak tipped past Salmond for his 24th goal of the season. After Lind scored to give the Rockets the lead at 18:39 of the third, the T-Birds pulled goalie Dorrin Luding for an extra attacker. The T-Birds got pressure on the Rockets and had several good shots but were not able to get the tying goal. Seattle outshot Kelowna 12-8 in the third period but the Rockets finished with a 29-27 advantage in shots. Luding had 24 saves on 29 shots and his record is now 9-13-0-1. Salmond had 23 saves on 27 shots and his record is now 10-8-0-1. First period – 1, Seattle, Neuls 20 (Ottenbreit, Hamaliuk), 7:26. 2, Seattle, Hamaliuk 14 (Wedman, Volcan), 11:35. Penalties – Kindree, Kel (hooking), :29. Pow, Kel (holding), 12:59. Second period – 3, Kelowna, C. Foote 16 (Dube, Bruggen-Cate), :19. 4, Kelowna, Dube 30 (Mattson, Gardiner), 2:13. Penalties – Chizen, Kel (major-fighting), 6:25. MacLean, Sea (major-fighting), 6:25. Katzalay, Sea (tripping), 8:22. C. Foote, Kel (slashing), 15:55. Third period – 5, Kelowna, Mattson 19 (Cowell, Korczak), 2:46 (pp). 6, Kelowna, Cowell 11 (Korczak, Kindree), 7:13 (pp). 7, Seattle, Wedman 15 (Volcan, Tyszka), 5:14. 8, Seattle, Andrusiak 24 (Philp, Hamaliuk), 15:15. 9, Kelowna, Lind 32 (Twarynski), 18:39. Penalties – Ottenbreit, Sea (charging), 2:31. Zabranksy, Kel (roughing), 2:31. Hamaliuk, Sea (roughing), 2:31. MacLean, Sea (tripping), 5:14. Harsch, Sea (major-fighting), 11:26. Gardiner, Kel (instigator, major-fighting), 11:26. Shots on goal – Seattle 8-7-12 27, Kelowna 9-12-8 29. 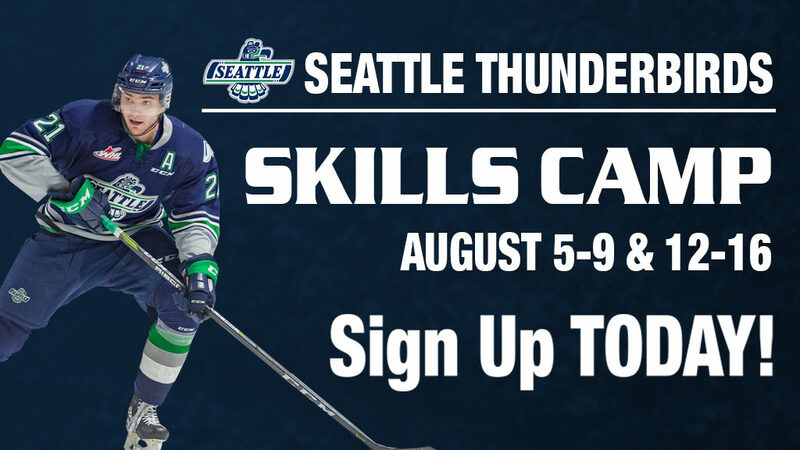 Goalies – Seattle, Luding 29 shots-24 saves (9-13-1-0); Kelowna, Salmond 27-23 (10-8-0-1). 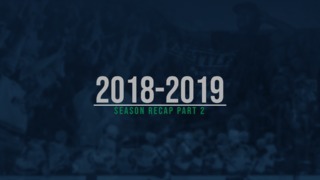 Power plays – Seattle 0-4; Kelowna 2-3. A – 4,859. Referees – Clayton Hall, Jeff Ingram. Linesmen – Dustin Minty, Cody Wanner.